Reimu Hakurei (博麗　霊夢, Hakurei Reimu) is the main protagonist of the Touhou Project series along with the deuteragonist, Marisa Kirisame. As the shrine maiden of the Hakurei Shrine, she manages the Hakurei Border of Gensokyo and exterminates troublesome youkai. Her personality is straightforward, optimistic, and a bit curious. She's quick to anger if offended, but just as quick to offer help to those in need. According to Komachi, Reimu has an innocent heart that can't truly hate anyone. While rather lazy in her free time, she's highly devoted to her duties as the Hakurei Shrine Maiden, resulting in a "shoot first and ask questions later" attitude to youkai extermination. This makes her known to exterminate youkai indiscriminately, regardless of how much of a threat they represent to her or others. One example is Tokiko, who was ambushed by Reimu while she was, in Reimu's own words, "reading and minding her own business". Apparently, however, she actually helps youkai in trouble when it really matters. For instance, in Silent Sinner in Blue, she kept Reisen (disguised as an earth youkai-rabbit) at her place to help healing her injuries, giving her the futon she uses to sleep and even going to Eientei to inform its residents that a wounded rabbit was at her shrine. She also treated Shinmyoumaru Sukuna well enough after the events of Double Dealing Character that the inchling gave her a matching kimono as a sign of gratitude. Since it was so small, Reimu had to wear it on the back of her head. It has been stated that Reimu treats everyone the same, whether they are humans, youkai or gods, giving them no particular respect or disrespect. This habit has caused her to inadvertently befriend many youkai she defeats. While she tries to keep youkai away from her shrine, this is because it makes it harder to gather faith from humans rather than because she dislikes them. 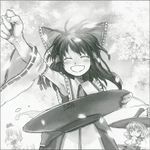 At the end of the symposium in Symposium of Post-mysticism, when Reimu goes to break it up, Miko notes that though Reimu says she wants to eliminate all the youkai, she actually just wants to attain a peace in Gensokyo that doesn't require violence, like the others present wish. While many inhabitants of Gensokyo are capable of flying, Reimu's ability extends beyond that; she is someone who excels at floating through life, displaying a level of oneness with her surroundings that has been compared to a hermit. While she "goes with the flow" Reimu displays superhuman instincts and incredible luck, naturally ending up on the path of least resistance through most situations; conversely, when distracted or acting with impure motives she quickly loses her edge. On one occasion observers saw Reimu dodging an attack "like she was made of air" while Reimu herself saw the attack swerving to avoid her; on another Reimu unknowingly walked across a river without getting wet, by stepping on fish that swam beneath her feet. This also makes Reimu's techniques extremely hard for Marisa Kirisame to learn from, since even Reimu herself has trouble explaining what she's doing. 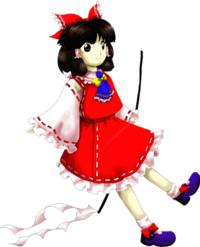 The ultimate expression of this ability is Fantasy Nature, which allows Reimu to float away from reality and become impossible to attack; this was considered too powerful for use as a spell card until Marisa gave it a name and time limit. It's stated in the omake.txt (おまけ.txt) of Embodiment of Scarlet Devil that Reimu can control the natural spirits of living things, an ability which isn't listed in any source afterwards. No clear instance of this ability has been displayed in canon. Reimu summoning powers Silent Sinner in Blue. As the Hakurei shrine maiden, Reimu can handle the Hakurei Yin-Yang Orbs, and is trained in youkai extermination techniques as well as standard duties like performing blessings. Reimu is also capable of invoking Gensokyo's native gods into her body, but she isn't well-trained enough to do so reliably. Reimu displays great aptitude with magical barriers (beyond that normally associated with shrine maidens), presumably related to her work in maintaining the Great Hakurei Barrier. Among her techniques are barriers that explode, push enemies (or herself), or act as portals for her other attacks. 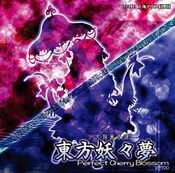 Reimu is capable of dismantling barriers and seals too complex for Marisa Kirisame and Patchouli Knowledge to understand, with what Marisa calls her "cheat technique". Reimu is the shrine maiden of the Hakurei Shrine, and one of the main "incident resolvers" in Gensokyo. She and others characterize the time she spends at the shrine as largely boring and uneventful. While she is sometimes serious about her duties, she can't seem to get many worshippers at her shrine. It appears that youkai extermination is her only method of earning even a thin salary. Kanako Yasaka has stated that if she was to acquire a tremendous amount of faith, she could become a goddess, but at the moment she acts more like a youkai. 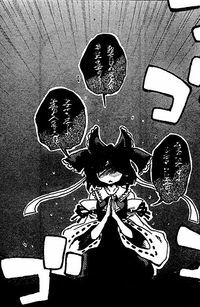 Yukari Yakumo describes Reimu's job as not being that of a youkai exterminator, but rather a "balancer between humans and youkai", who prevents youkai from attacking humans and humans from becoming youkai. Wild and Horned Hermit depicts Reimu as frequently coming up with various schemes to make money, which generally fail due to her own lack of foresight. In most of the Touhou games, Reimu uses the Yin-Yang Orbs in combat. 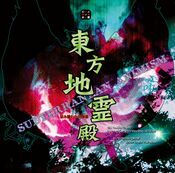 In Subterranean Animism they also functioned as communicators with people above the surface. In addition, she usually carries a gohei, sometimes referred to as her purification rod, originally prepared by Rinnosuke Morichika. She also possesses a great amount of ofuda, sacred paper charms with anti-youkai properties that she uses to fight, seal or exterminate youkai of any kind in her danmaku. Apparently, she can also use them to create barriers and even clones of herself. Like the Yin-Yang Orbs, she uses them in most, if not all, games she has appeared in, either as a normal shot (usually with homing properties) or as bullets for her spell cards. Aside from this, the other projectile she uses is a large collection of throwing needles hidden within her sleeves. In PC-98 canon, she possesses a robot called Ruukoto, given to her by Yumemi Okazaki as a reward for defeating her. Ruukoto has not been seen outside of Phantasmagoria of Dim.Dream. Not much is known about Reimu's history prior to the events of the games. 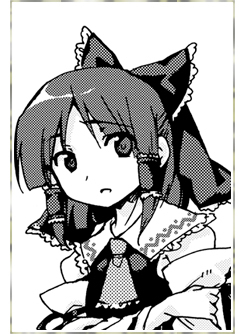 Her earliest mention in the Gensokyo timeline is four to five years prior to Chapter 22 of Curiosities of Lotus Asia, which took place in 2006. ZUN does mention in one of his Shanghai Alice Correspondence documents that there was a previous Hakurei Shrine Maiden, and it's generally assumed that there's a line of them. In Chapter 25 of Wild and Horned Hermit, with night's darkness fast approaching, an annoyed Reimu remarks, "Believe not they will be around for you always: parents and daylight". The quote was thought to imply that Reimu knew her parents, but they're gone and she's rather bitter about it. However, her line was modified from a haiku about the transient, changing nature of things, the original subjects being parents and money (いつまでも / あると思うな / 親と金). In chapter 2 of Curiosities of Lotus Asia, Marisa remarks, "She was an orphan", though the context of this scene suggests that this could just be a throwaway line. 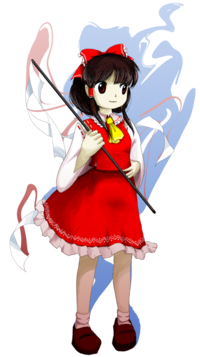 Reimu, as illustrated in Perfect Memento in Strict Sense. Reimu Hakurei as a Shrine Maiden in Highly Responsive to Prayers is based on the character Sayo-chan, who's the protagonist of KiKi KaiKai. The Bakebake are also based on this game. In general, ZUN thought it was a good idea to include a shrine maiden in an STG compared to other typical futuristic STGs simply because it was unusual at the time of her creation. 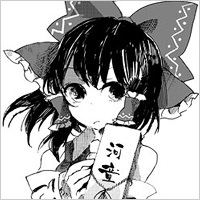 Reimu's full name is Reimu Hakurei (博麗 霊夢). 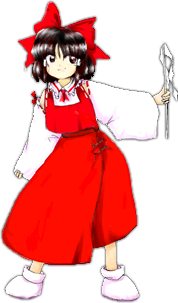 The characters for Reimu's last name Hakurei (博麗) literally mean something along the lines of "esteemed companion". The first word Haku (博) means "wide" or "exposition" while Rei (麗) means "lovely", "graceful", or "beautiful". Her first name Reimu (霊夢, lit. "spirit/soul dream") is a relevant Japanese word that refers to a "divine revelation made through dreams". In the PC-98 game era, her name was written with a slight difference. 博麗靈夢 was changed to 博麗霊夢 from Shuusou Gyoku onwards. "靈" is an uncommon form of "霊" with identical meanings. 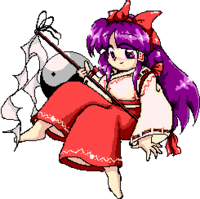 In the Japanese community, "博麗靈夢" is used to refer to Reimu in the PC-98 era specifically. Incidentally, Chinese (Taiwanese) fans who use the Traditional Chinese characters also adopt this style to refer to Reimu in general (old Japanese kanji form and traditional hanzi are basically identical). Reimu is of moderate height. 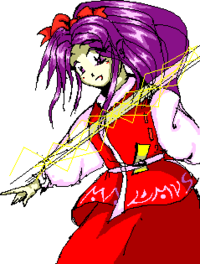 In PC-98 canon, she is depicted as having purple hair and eyes, and she wears a large red ribbon at the back of her head, and red tubes on her sidelocks. From Story of Eastern Wonderland to Mystic Square she wears an outfit like a traditional shrine maiden uniform, with a red hakama over a white kimono. However, her best known design is that of the Windows era. She has brown-black hair which varies in length and style between games (tending towards long and loose in later works), and her eyes vary from brown to red to even blue depending on the game, but she still wears a red ribbon and matching tubes on her sidelocks. She's still seen in her "shrine maiden uniform", but it now bears little in common with the standard uniform beyond the red-and-white colour scheme (which ZUN has acknowledged). This uniform consists of a red skirt (rather than the standard hakama), a sleeveless red top with a white collar, tied with a yellow ribbon (a red ribbon in Embodiment of Scarlet Devil and Perfect Cherry Blossom, a blue one in Phantasmagoria of Flower View, Subterranean Animism, Hopeless Masquerade, Urban Legend in Limbo and Legacy of Lunatic Kingdom), and a pair of white detached sleeves which expose her armpits and sarashi. Due to the color scheme, she's occasionally called the "red-white shrine maiden". Her shaman clothing and her purification rod came from Rinnosuke Morichika, but it's unknown who designs them. 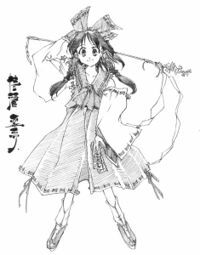 In chapter 7 of Strange and Bright Nature Deity, she used chopsticks with her left hand, and it was stated that she was left-handed (this statement was deleted in the collected edition), but she held a pen with her right hand in Subterranean Animism. It has been speculated by fans that, assuming this wasn't an art error, she may be ambidextrous or just used to writing with her right hand. 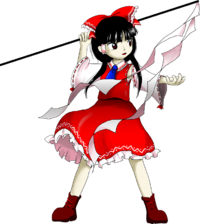 Unless specified, Reimu has always held the role of a playable character in the majority of the games. A lone shrine sits Far East: the Hakurei Shrine. The powerful seal placed there has worn away, and many strange creatures are starting to come out. Now Reimu, seeking revenge (or possibly just to sate her curiosity), and armed with the shrine's treasure, the Yin-Yang Orbs, goes to the gate to face the non-human creatures inside. The gate will lead to either Makai or Hell depending on which route the player chooses. Reimu is training intensely in the harsh extremities of a mountain (or taking it easy), but when she returns to the shrine, she finds it infested by youkai, ghosts and other non-human creatures. With her faithful turtle Genjii and her trusty Yin-Yang Orbs, she sets out to find the one who caused the trouble. Her journey leads her to Rika, the culprit, as well as Mima, who has broken the seal placed on her in Highly Responsive to Prayers, and desires the power of the Yin-Yang Orbs for herself. Reimu is victorious in battle and learns the truth behind the Yin-Yang Orbs. Things have been peaceful lately so Reimu has time to kill. When some old ruins appear near the shrine, promising a reward for whoever can manage to make it inside, she decides to enter a sort of tournament to decide who'll go in. This is the first time Reimu appeared as a boss. Assuming she's the player character, she defeats all six opponents and makes it inside to confront Chiyuri Kitashirakawa and Yumemi Okazaki, who have come from the real world in search of proof of magic. As a reward for defeating her, Yumemi gives Reimu the housekeeping robot Ruukoto. Reimu mulls over on how quiet things have been, but soon enough, youkai and spirits start flooding out into Gensokyo again, putting her shrine in danger. She confronts a few, then realizes this must have been the work of something bigger, and decides to go straight to the source of the issue. She makes her way through to the Fantasy World, where she finally meets Yuuka Kazami and defeats her. A large outpour of demons are appearing throughout the land from Makai, and Reimu sets out to exterminate them. She reaches the creator of Makai itself, Shinki, and defeats her in battle. Afterwards, she learns that the youkai and demon overflow in Gensokyo is the fault of some kind of Makai travel agency. Shinki promises to do something about it, but the demons make their way back to the shrine anyway. A scarlet mist covers the sky of Gensokyo. Reimu, who's annoyed by the mist, sets out to stop the incident. Her travels lead her to the Scarlet Devil Mansion, whose owner, Remilia Scarlet, has spread the mist to try and block out the sun's rays, as she is a vampire. After defeating her, Remilia soon comes to visit her at the shrine, but Reimu has to return to the mansion when an odd rain suddenly appears over it, in order to deal with Flandre Scarlet. Even though it's May, spring shows no signs of coming, leaving the inhabitants of Gensokyo in a cold winter weather that only gets worse. Reimu, noticing cherry petals blowing from the Netherworld, decides to set out and stop the perpetrator from holding spring hostage. 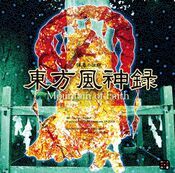 After making her way into the Netherworld, she comes to Hakugyokurou, where the ghost Yuyuko Saigyouji spends her time administrating the spirits of the dead. She was gathering the essence of spring to try and make the Saigyou Ayakashi bloom, but Reimu stops her before she completes it. Later on, Yuyuko asks Reimu to go deal with her friend Yukari Yakumo, as she's the one who has been weakening the boundary between Gensokyo and the Netherworld, and she does so, after fierce combat. Yukari then restores the strength of the boundary. 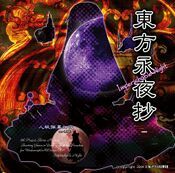 Yukari isn't able to sleep and discovers the full moon is nowhere to be found; it has been replaced with a fake moon, and the night appears to have stopped. She convinces Reimu into investigating the cause with her. 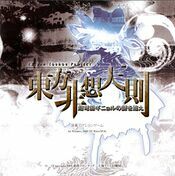 After dealing with a few youkai, and Marisa Kirisame in particular, who demands to know why they've created this eternal night, they reach Eientei, a house hidden in the Bamboo Forest of the Lost. Once there, they either confront Eirin Yagokoro or Kaguya Houraisan. Eirin explains that she actually sealed the Earth away from the Moon in order to prevent the Lunarians from taking Kaguya back. Kaguya, however, has tired of hiding, and so challenges Reimu and Yukari to complete her five impossible requests. Once they're defeated, they undo the seal (and thus "return" the real moon to Gensokyo). Afterwards, they all decide to have a moon viewing. Later on, Kaguya sends them into another part of the Bamboo Forest of the Lost as a "test of guts" - but her true intentions are revealed to be trying to annoy Fujiwara no Mokou, another immortal human, and her eternal rival. Reimu, who's usually easy-going, is disturbed by the amount of flowers blooming and, not to be the one who shrugs off her duties, goes on to search for answers. She fights through many opponents, including news reporter Aya Shameimaru, in search of the truth. Eventually she reaches Muenzuka, where the shinigami Komachi Onozuka, who appears to have been slacking off on her job to manage said spirits. Eiki Shiki, Yamaxanadu appears after Reimu beats Komachi up, and explains what's happening - an awful lot of spirits of the dead suddenly arrived from the Human World, and they're having trouble accomodating all of them. After a lecture, they do battle, and Reimu emerges victorious. The three of them have a flower viewing later on, where it's explained that as the spirits of the dead cross the Sanzu River, the flowers' blooming will settle down. Reimu's shrine has become a hotspot for youkai, so she doesn't get many human visitors to do patronage. She receives a foreboding threat from a mysterious human visitor, who demands that the Hakurei shrine be shut down and submit to another god. Reimu, always the optimist, decided to go to Youkai Mountain to face the goddess who's making these threats. She fights her way up to the Moriya Shrine and defeats its shrine maiden, Sanae Kochiya, as well as its resident god, Kanako Yasaka, thus saving her own shrine. Afterwards, Reimu summons everyone to the shrine to watch the autumn leaves, where she vouches for Sanae and Kanako and tells Nitori and Aya that they should invite them over for drinks sometime and generally get along. Sanae also tells Reimu that youkai are a good source of faith. A while later, Marisa brings Reimu the rumor that a second god is actually living at the Moriya Shrine, and she goes to check it out. She then meets Suwako Moriya and defeats her. A geyser appears behind Hakurei Shrine, and at first Reimu is happy, since its heat will alleviate the cold of winter. However, evil spirits begin emerging from the earth and loitering about Gensokyo. Reimu is sent to investigate with either Yukari Yakumo, Suika Ibuki, or Aya Shameimaru, depending on what shot type the player chooses. She communicates them throughout her trip via her Yin-Yang Orbs. She heads straight to the Underworld, and fights her way deeper and deeper until reaching the Palace of the Earth Spirits. There she meets Satori Komeiji, whose two pets apparently have something to do with it. Reimu defeats Rin Kaenbyou, then reaches Utsuho Reiuji, who, with her newfound powers, is maintaining the hellfire that heats the Underground, and is responsible for the geysers that let the evil spirits leak out. She defeats her as well, then returns to the surface. Rin starts frequenting the shrine, though mostly for food, and eventually they make the geyser behind the shrine into a hot spring. Utsuho later explains how she came to possess such power, and it seems to point straight towards Kanako and Suwako, so Reimu sets off for the Youkai Mountain again. When she gets to the shrine, however, she meets Koishi Komeiji, who was apparently also looking for who gave Utsuho those powers. Suwako comes out to meet them after they fight and explains it's all part of their "industrial revolution project". When the treasure ship appears in the skies of Gensokyo, Reimu decides to go after it. She forces her way into it only to discover that there's no treasure inside. However, Minamitsu Murasa tells her they're headed to Makai to revive a "saint" of some sort. 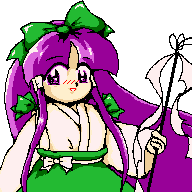 She follows them there and meets Byakuren Hijiri, a Buddhist monk that loves youkai and humans equally. That certainly won't do, so Reimu beats her up. She and Byakuren later fly around the skies on the ship, but afterwards the ship is landed and renovated into the Myouren Temple. A little later, she follows up on the strange light that was following her during the journey, and it turns out to be Nue Houjuu, a straggler from Byakuren's group. Reimu defeats her and persuades her to visit the temple. A large number of divine spirits appear, threatening the flower viewing, so it's up to Reimu to figure out what's causing it. She visits the Netherworld first; while Yuyuko Saigyouji isn't the culprit, she points the shrine maiden towards the Myouren Temple. After forcing her way to the graveyard, she discovers the spirits all flocking to the Hall of Dreams' Great Mausoleum. Once inside, she defeats the newly resurrected Mononobe no Futo and Toyosatomimi no Miko in battle. When she finds that the temple is bringing in a youkai from the outside world for war against Miko, she finds and defeats Mamizou Futatsuiwa. 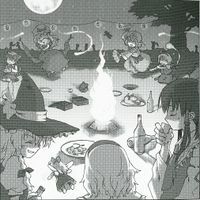 As Reimu makes preparations for an upcoming feast, both humans and youkai are drawn to the feast and are unable to stop partying. Reimu is suspicious of a strange mist that covers Gensokyo and goes to investigate. She roams around, beating up various characters she suspects to be the culprit. She cannot find them; but on the day of the feast, Suika Ibuki finally makes herself known, and Yukari Yakumo shows Reimu to her. Suika soons becomes attached to hanging out at the Hakurei Shrine. 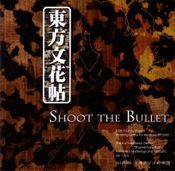 Reimu doesn't actually appear in Shoot the Bullet, but instead in a "Special story" that was added to the afterword. It shows that she and Marisa Kirisame are talking about a notebook Marisa found. The Hakurei Shrine is suddenly destroyed by an earthquake, but upon consulting with Marisa, Reimu finds out that no one else felt it, so there must be something odd going on. She goes around to various suspicious characters, including Komachi Onodzuka, who Reimu initially suspects. However, it's not her, so Reimu ends up making her way towards Heaven, where the celestials Iku Nagae and Tenshi Hinanawi reside. Tenshi reveals she started the incident simply because she was bored watching everyone else getting involved in incidents and wanted to start her own. 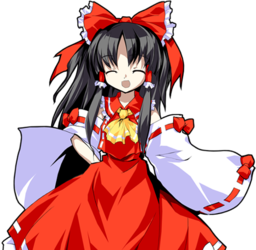 She also claims she destroyed Reimu's shrine so Reimu would be motivated to resolve the incident; Reimu promptly resolves the incident by defeating Tenshi. Afterwards, Tenshi has a legion of celestials help rebuild her shrine. Reimu, not the main character, is only playable via selectable character to play with. In Sanae's scenario, Reimu fights Sanae in the Underground Geyser Center, but is defeated. Later on, she reads about Hisoutensoku later on in a newspaper in the ending. Also in Meiling's scenario, she doesn't actually appear here, to which is in fact a pseudo-Reimu who was sent by the Giant Catfish to assassinate Hong Meiling in her dreams, but was defeated. 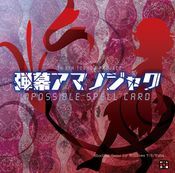 In Double Spoiler, Reimu appeared as a stage Ex target, where she uses a few spell cards and had Aya Shameimaru and Hatate Himekaidou take photos of her and her danmaku. 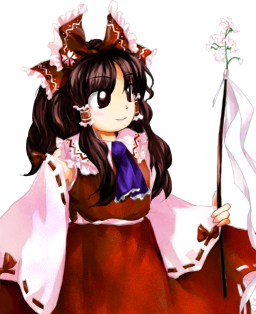 Reimu appeared in Fairy Wars as a cameo on the Route B1 ending. As Cirno and the Three Mischievous Fairies were terrorising Reimu when she's unaware of who's attacking her, she gets angry and shoots bullets omnidirectionally. 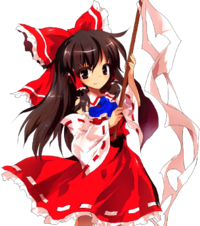 Reimu represents Shintoism in the religious war between Shintoism, Buddhism, and Taoism. She finds that "hope" is being sapped from the village people by Hata no Kokoro and battles her to stop her. Reimu appears as the boss in the one-stage minigame Gold Rush. Extending from Impossible Spell Card, Seija Kijin somehow acquired the ultimate 10th "rule-breaking" item the Miracle Mallet (Real), which is capable of destroying danmaku, and decides to make use of it by robbing the Hakurei Shrine before its power runs out. Reimu uses three spell cards and non-spell cards on Seija before she's defeated. Shortly after the events of Perfect Cherry Blossom, Aya Shameimaru attends a flower viewing at the Hakurei Shrine, where she meets Reimu, who's in a foul mood since no one wants to help her clean up after event. 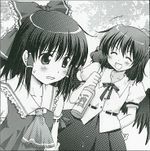 Aya plies her with sake and questions her about the incident, commenting in the article that "Reimu just seems to be a laid-back drunkard". In the follow-up interview, Reimu claims Aya's paper is full of lies and insists her account of the incident is true, though Aya still doesn't recognize Reimu's deeds. Sometime not long after the events of Mountain of Faith, Reimu is recruited by the members of the Scarlet Devil Mansion to power their rocket to the moon. The group is defeated by the Watatsuki sisters, who keep Reimu on the moon for a short period of time to clear their names before returning her unharmed to Gensokyo. Unbeknownst to almost everyone involved, their voyage was simply one part of a complex ploy by Yukari to intimidate the residents of Eientei. In Symposium of Post-mysticism, Reimu appeared on part 6 of the symposium. It was stated that Reimu was hiding and hearing over the whole symposium, that was attended by Hieda no Akyuu, Marisa Kirisame, Kanako Yasaka, Byakuren Hijiri and Toyosatomimi no Miko. When she was revealed by Akyuu, Marisa noticed that she had an angry look on her face (although she seems to not be angry with Akyuu). That's because she's not happy with the discussion the group was having, believing that it's all nonsense. She slammed a pile of newspapers in front of them to prove how bad the youkai are and tells them to stop the symposium immediately. She was requested by the humans of the Human Village to stop this as they were aware – and felt uncomfortable – of "non-humans" discussing on changing the way of Gensokyo's life. The group were unhappy with her personality and her way of "fight-first, ask-later" attitude towards youkai, and can't even spend another minute finishing their sake. 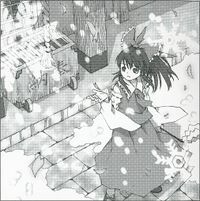 There was also an article included, written by Aya Shameimaru, that involved Reimu's broken-down Hakurei Shrine during the events of Scarlet Weather Rhapsody. It stated that it collapsed due to a localised earthquake and that the roof caved into the shrine. Aya found it suspicious that a celestial, that been Tenshi Hinanawi, came to help and re-build it. Reimu finds her shrine frequented by a mysterious hermit going by the name of Kasen Ibaraki. Wild and Horned Hermit follows the various escapades and adventures of Reimu and her friends in concurrence to the timeline of the games. Reimu in WaHH is generally short-sighted and obsessed with making a profit. 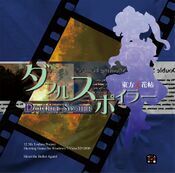 When book-lender Kosuzu Motoori of the Human Village begins dabbling with demon books, Reimu finds herself frequently having to sort out the incidents caused by the youkai that are released from them. In contrast to Wild and Horned Hermit, which is fairly lighthearted, Forbidden Scrollery depicts Reimu as a shrine maiden who struggles to maintain the image of a protector for the Human Village while maintaining the masquerade set in place by the youkai. Reimu as she appears in Shuusou Gyoku. Note: This section is part of the Seihou Project by the Doujin circle "Shunsatsu sare do?". Reimu has made a guest appearance as the second Extra stage boss of Seihou Project's first work Shuusou Gyoku, a danmaku game series by the junior doujin circle "Shunsatsu sare do? 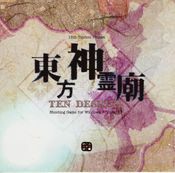 ", where ZUN also contributed music and art to the game. 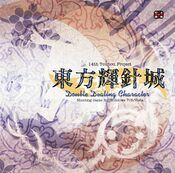 It seems like ZUN put her in the game along with Marisa Kirisame. 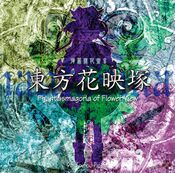 Her title was "Eternal Shrine Maiden" and her theme was "Dichromatic Lotus Butterfly ~ Ancients". To add to this, Yuuka Kazami made a guest appearances in the following work, Kioh Gyoku. She seems to have no view towards the Seihou World; she doesn't know that there's no vegetation and has no thoughts about scientific machinery. After VIVIT defeated Marisa at the Hakurei Shrine in Gensokyo, Marisa was then thudded by Reimu for fighting at the Hakurei Shrine. Reimu attacked her with two purification rods before she could explain what she was doing. After Reimu lost, VIVIT told her that she was looking for the Holy Grail, causing Reimu to become confused and start asking questions. 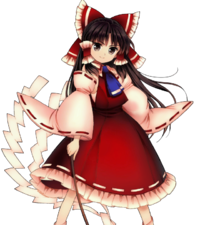 Although Reimu often shows up as the main character, she doesn't participate in mundane activities to the extent Marisa Kirisame does, limiting her familiarity with most of Gensokyo's population. Nevertheless, she has interacted with almost every other character that has ever made a physical appearance, with a few exceptions such as the Giant Catfish, Renko Usami, and Maribel Hearn. 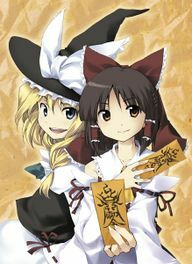 Reimu and Marisa, in Silent Sinner in Blue. Reimu's best friend is likely Marisa Kirisame, who spends a lot of her time at the shrine. They're there together the majority of the time in various print works, prologues, and extra stage prologues, hanging out together and discussing or attending the latest events in Gensokyo. 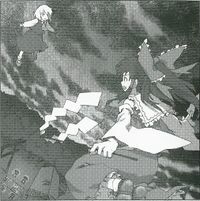 Reimu has known Marisa since Story of Eastern Wonderland, where Mima had Marisa fight Reimu. Their friendship may have started soon after that, as in all of the bad endings, Marisa decides she needs to train more, and drags Reimu along to train with her, much to Reimu's chagrin. 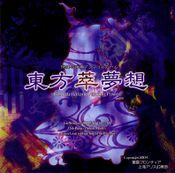 Despite her antagonistic personality, Yukari Yakumo mentors Reimu by pushing her to increase her spiritual powers, such as learning how to invoke the gods in Silent Sinner in Blue. She also occasionally seeks Reimu's assistance in resolving incidents in Imperishable Night and Subterranean Animism. Reimu is familiar with Rinnosuke Morichika, a shopkeeper who owns Kourindou, who she sometimes visits to hang out or for wares (and sometimes shoplifts). She apparently has a large unpaid tab for requested items and services, but denies it since Rinnosuke "never accepts money" (which he denies being the case). Rinnosuke was also the one that originally prepared her purification rod for her use. Despite being the priestess of a rival shrine, Sanae Kochiya is on friendly terms with Reimu and appears frequently in Wild and Horned Hermit alongside Reimu and Marisa. She came on a bit strongly when she and Reimu first met, but she really thought she was helping the Hakurei Shrine out by attempting to get it to switch gods to Kanako Yasaka. After Mountain of Faith, Sanae offered to help Reimu as a fellow shrine maiden to gather faith for the shrine, and she appears to have been friends with Reimu since then. Nonetheless, the two have no qualms about antagonizing the other at times, though these quarrels are usually resolved by the next time they meet. In the PC-98 canon, Reimu used a turtle as a means for flight until the end of Mystic Square; that turtle was Genjii. Reimu calls him "gramps". 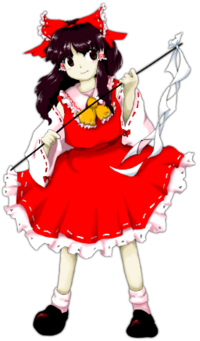 Reimu is often the target of pranks by the Three Fairies of Light, and Reimu tends to exterminate them on sight whenever she catches them (unless Marisa's escorting them). As of Oriental Sacred Place, the three fairies moved into a tree near the Hakurei Shrine and become Reimu's neighbors, increasing the amount of pranks even more. Reimu aims to evict the fairies, but cannot find their treehouse, which is actually located on the Hakurei Border. Eventually, in an attempt to befriend Reimu so she'll no longer threaten them, the three fairies challenge her to a battle, reasoning that Reimu tends to befriend many youkai after fighting them. After an intense battle, Reimu finally defeats the fairies (instantly), and points out that their line of reasoning is utterly ridiculous. Despite this, Marisa finds that Reimu befriended the fairies after all, and as of the end of Oriental Sacred Place, the fairies now happily openly spend time at the shrine while helping Reimu out with various chores. Reimu views Byakuren Hijiri and the Myouren Temple as a rival of sorts to herself and the Hakurei Shrine. In Ten Desires, Toyosatomimi no Miko points out that Reimu is friendly towards Byakuren. Although Reimu says they're religious rivals, she doesn't seem to deny it. In one of her Undefined Fantastic Object endings, Reimu is depressed at how quickly Byakuren's temple is picking up followers compared to her own shrine. By the time of Strange and Bright Nature Deity, Reimu is angry at the temple for stealing away her shrine's followers (ignoring that her shrine never had (m)any followers in the first place), but Byakuren seems unaware of this. Kasen Ibaraki is a regular at the shrine and acts as a mentor (and sometimes guardian) of Reimu, whom she fears is too concerned with worldly desires. Kosuzu Motoori, the daughter of the book-lender in the Human Village, has a great deal of respect for Reimu. She is convinced that no harm will come to her from dealing with the youma books, because she is sure that Reimu will come save her if anything happens. Reimu knows next to nothing about the god dwelling in her shrine, making her unable to provide it with faith despite her efforts. 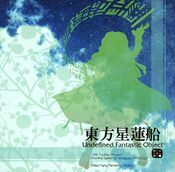 Byakuren stated in one of the endings for Undefined Fantastic Object that the god is mad due to this. In the PC-98 canon, she obtains a robotic maid named Ruukoto as a servant at the end of Phantasmagoria of Dim.Dream though no reference has been made to it since. In the PC-98 canon, Mima is an Akuryou who haunts the surroundings of the Hakurei Shrine, after many confrontations and being resealed by Reimu, she decides to spend her days making fun of the shrine maiden. Suika Ibuki, who often freeloads her shrine after the events of Immaterial and Missing Power is also is her ally during Subterranean Animism. Reimu saw Suika's presence as a nuisance at first, but never really bothered with driving her away. Aya Shameimaru, the tengu reporter was also her ally during the events of Subterranean Animism. In Wild and Horned Hermit Chapter 8, The Unnamed kitsune offered to help Reimu gain worshipers after being caught disguised as Marisa during a party at Hakurei Shrine. 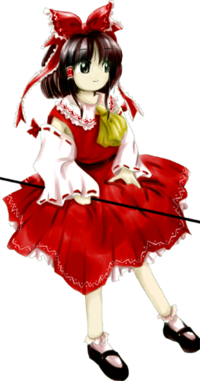 She was, however, deceiving Reimu by letting her use the powers of her kuda-gitsune. Using her ability, they gathered worshipers. Kasen Ibaraki discovered that these fox youkai had been consuming Reimu's willpower and wealth as payment for their help. However, they managed to walk away from the Hakurei Shrine with all her wealth. 夢符「封魔陣」 Dream Sign "Evil-Sealing Circle" Related: Divine Arts "Omnidirectional Demon-Binding Circle"
「反則結界」 Mikuji "Rule Violation Barrier"
「天国にいちばん近いお賽銭」 "The Donation Closest to Heaven" GR "St. Ex"
「だんまく長者」 "Danmaku Millionaire" GR "St. Ex"
Reimu is the most frequent character to appear in the Touhou Project games, with Marisa Kirisame coming second. 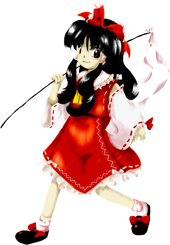 Reimu appears in every Touhou game, two times more than Marisa, who didn't appear in Highly Responsive to Prayers and the minigame Gold Rush. 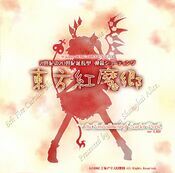 Reimu appears on the cover of all five PC-98 games. Reimu seems to be scared before and after the boss battle with the Five Magic Stones, making this the only ever time that Reimu was scared and/or afraid of a boss before and after the battle. 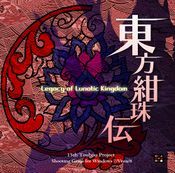 Most of her theme from Lotus Land Story sounds similar to Elis and Kikuri's theme from Highly Responsive to Prayers, "Magic Mirror". It was originally stated that she lives alone at the shrine, but other rarely seen characters (Mima and SinGyoku) are known to stay there or near there as well. Even then, Reimu claims that most youkai visitors are nuisances, and she'd prefer to be left alone. Marisa Kirisame seems to be one of the few who she wouldn't drive away. 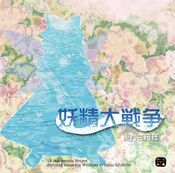 Watatsuki no Yorihime from Silent Sinner in Blue – along with VIVIT from the Seihou Project – are thought to be the only ever known characters to have defeated Reimu. However, Yorihime's victory was from a manga, and VIVIT's victory was from a separate series. In Imperishable Night, Reimu is the only one whose partner doesn't mention the danger of the full moon. Reimu's ultimate technique Fantasy Nature (夢想天生, musou tensei, "innate fantasy gained at birth") is homophonous with the ultimate technique of the Hokuto Shinken school in Fist of the North Star, Musou Tensei (無想転生, musou tensei, "nil-thought rebirth"), and has much the same effect. 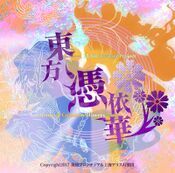 In Touhou Hisoutensoku, if you activate Fantasy Nature successfully in a 3rd round, a remix of "Eastern Mystical Love Consultation" will play which resembles Ai wo Torimodose, the opening theme of the Fist of the North Star anime (an instrumental version of which usually plays whenever Kenshiro is about to win a fight). In Touhou Hisoutensoku, one of her alternative palettes looks similar to VIVIT. Also, one of her palettes seems to be another maid homage, Ruukoto, or possibly Sanae Kochiya's colours. The palette also seems to resemble Mima from Highly Responsive to Prayers. Her white/light gray palette seems to resemble Toki from Hokuto no Ken and possibly somewhat similar to her white outfit from the fangame Concealed the Conclusion. 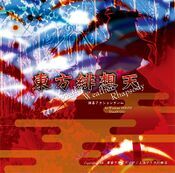 When playing Yukari's story mode in Scarlet Weather Rhapsody, Reimu breaks down in tears in the ending after Yukari defeats Tenshi and reduces the Hakurei Shrine to rubble for the second time, with Sakuya and Youmu looking on helplessly (although Suika offers to help rebuild it). This marks the first and only time where she's seen crying in a storyline scenario. 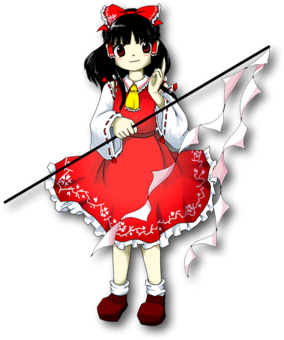 The shrine maiden at the end of Dolls in Pseudo Paradise is probably Reimu. She has Reimu's title, "Shrine Maiden of Paradise" (and her personality), and according to Bohemian Archive in Japanese Red's Music Column, the shrine maiden in the song that accompanies the ending section is Reimu (so basically, this shrine maiden has Reimu's song and title). However, only the shrine maiden at the end is referred to as the shrine maiden of paradise. Thus it's possible that the shrine maiden seen in the first half of the story is a different person altogether. A "13th Shrine Maiden" signs off the Gensokyo Record in Perfect Cherry Blossom's prologue. 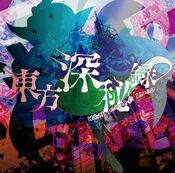 ZUN has stated in an e-mail that the Gensokyo Record is unreliable (for one thing, the writing style of each section shows it was written by a different person each time), thus "there's a high possibility that Reimu isn't the 13th Hakurei shrine maiden." (technically, this also means there's no proof that the person who wrote that section of the record is a shrine maiden at all). It' is shown in Oriental Sacred Place that the shrine sometimes gets various donations (including wine) from unknown sources (implied to be from the outside world, as the Hakurei Shrine lies on the border) and Yukari is shown in Oriental Sacred Place to sneak yen donations into the offering box when Reimu isn't looking. 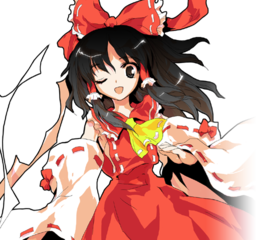 Although Reimu has successfully resolved the incidents in each major Touhou game, it is possible that her win rate throughout the actual events of the games wasn't 100%. Perfect Memento in Strict Sense states that Reimu likes to request rematches until she finally wins. In game terms, Reimu apparently has had to use a few continues every once in a while, but she still manages to get a good ending. In Hidden Star in Four Seasons, Reimu does not defeat Okina Matara at stage 6 initially, being led into a trap leading to her defeat. She challenges Okina to a rematch in the Extra Stage and, after devising a countermeasure, defeats her. 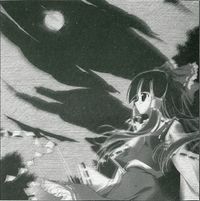 VIVIT made reference to Reimu in both Kioh Gyoku and Samidare, believing she met her – when talking to Yuuka Kazami – in the former, and referring to her as "red-white" in the latter. In Wild and Horned Hermit chapter 46, Reimu experiences a near-death experience because of food poisoning. It is also revealed, in the same chapter, that she has trouble of taking care of herself. Shrine maiden of the Hakurei Shrine, She has some spirit-power by nature, but lacks training. Her weapon is the mighty Yin-Yang Orb, but her control is somewhat unstable. But anyway, with her spirit-power, she got quite some skills. Her usual attacks -namely amulet-attacks, spirit-power discharging (霊撃 -Spirit strike-), melee skills- are useless to current enemies. She's in some trouble. Currently, she's the only person in the shrine. A shrine maiden of Hakurei Shrine, who possesses natural-born spiritual power but lacks training. She exterminates youkai by attacking with amulets, firing her spiritual power called Spiritual Attack and releasing the power of Yin-Yang Orb. She's such an optimist that she doesn't worry at all even in this emergency, and believes she can solve all incidents with her power. This time, she (somehow) fights riding on the turtle. A shrine maiden of Hakurei Shrine, who has the natural-born spiritual power and lacks training. She exterminates youkai by attacking with amulets, firing her spiritual power called Spiritual Attack and releasing the power of Yin-Yang Orb. She's an optimist. She faces some strange incidents, but still she enjoys them. As usual, she (somehow) fights riding on the turtle. This time, she feels somewhat suspicious, yet she's excited about the incident. The shrine maiden of Hakurei Shrine, who possesses natural-born spiritual power but lacks training. She exterminates youkai by attacking them with amulets, firing her spiritual power in a Spiritual Attack and releasing the power of the Yin-Yang Orb. Due to her slightly emotional and simple character, she's always made fun of by Marisa. A shrine maiden of Hakurei Shrine, who possesses natural-born spiritual power but lacks training. She exterminates youkai by attacking them with amulets, firing her spiritual power in a Spiritual Attack and releasing the power of the Yin-Yang Orb. Because of her slightly emotional and simple character, she's often made fun of by Marisa. The shrine maiden of Hakurei Shrine. Talented, but lacks training. Basically, she doesn't like to train. They say she has fought plenty of magicians, evil spirits, youkai and even gods with her strong spiritual power (for no particular reason). She's always involved in some strange affairs, though she seems to be dragged into most of them due to Marisa. Reimu pretends not to notice this. She sees Marisa as essentially a hopeless case. Shrine maiden of the Hakurei Shrine, and protagonist of the Touhou series. She appears quite carefree on the outside, and indeed deep down, she really is carefree. She lives in her shrine and is rarely visited by anyone, which causes her to be out of touch with current social norms. Even though she only extinguished certain sparks of conflict because they seemed to befall her without warning, her actions have generally resulted in preventing the residents of Gensokyo from visiting human settlements, and keeping outsiders away from wandering into Gensokyo. Charms and the yin-yang orb are her weapons. Additionally, she has the ability to fly in the air. Chronologically, this title isn't too far from the previous title, thus her age stays the same as before. There is nothing special about her being a shrine maiden. Or rather, she's a shrine maiden only because the Touhou series has become the "Shrine Maiden Shooting Game" series. It feels like the cart has been placed before the horse to me. This time, her outfit isn't overly intricate like typical shrine maiden clothing, but has become quite simple and only remotely resembles that of a shrine maiden. Is she really a shrine maiden? She's more like "You, red-white!" in my opinion. Hakurei Shrine's shrine maiden, and the protagonist. Her mind might appear normal, but in fact it's like spring in full bloom. The shrine is always haunted by youkai, and they're very friendly to Reimu as well. She's hardly performing the role of a shrine maiden at this point. She hates training, and because of this, lacks ability. So her skill is quite so-so. She hates to do her very best at anything that falls upon her. That's because she doesn't believe that effort will be rewarded. She has a smaller hit box, and her focused movement allows player to dodge very precisely. Spirit Sign's "Hakurei Amulet" is quite easy to use. It allows you to focus on dodging bullets. On the other hand, Dream Sign's "Extermination" wields destructive power of the highest class. Bosses are killed quickly, but the invincibility duration of her bombs is the shortest of all characters. It's also lacking in both effective radius and damage. She possess the ability to mainly fly in the air. Basically, she's a shrine maiden. The shrine maiden of Hakurei Shrine, which is located on the boundary of Gensokyo. The Hakurei Shrine exists in both Gensokyo and the world of humans at the same time. The boundary is the home territory of the Hakurei Shrine. From both sides, it's located at a very remote place from human villages, and is also kind of small, and has no known history or benefits. So it's no wonder that it rarely gets any visitors. Inside the shrine, almost all foreign boundaries has been nullified. That alone should say that the Hakurei Boundary, the boundary between Gensokyo and the world of humans, is amazingly powerful. Only those of the Hakurei have rules to follow in Gensokyo. Therefore, Reimu always wears clothes that's apparently some kind of uniform (she's supposed to have many other rules too, though...). Her daily routine consists of wearing red-white, staring at Gensokyo's sky from the edge of Gensokyo, and drinking tea. By nature, Reimu can use various mysterious powers, but she doesn't use them or boast about them. Everything is, as is, after all. A typical shrine maiden from Hakurei Shrine. She always lives on ideas off the top of her head, and doesn't consider something seriously. The only thing she does that actually resembles a shrine maiden's duties is enjoying tea and life on the veranda. She's quite simple-minded, thus when she's angry she's angry, and when she smiles she smiles. Her open personality makes her well-liked by both humans and youkai. Due to that, many people stay close to the shrine. She lacks training in both melee and spells (or rather, she rarely does them), but she covers that up with the numerous talents she's born with. So she's quite tough, enough to make you wonder if she's really a human. While she warps or uses guided shots, it's all straight from her perspective. What a mean shrine maiden. A human that lives on the boundary. She has the ability to fly in the air. She's the shrine maiden of the Hakurei Shrine, which is located at the edge of Gensokyo and (possibly) has ancient and honourable origins. She's emotional and noisy, and has a presence wherever she is, but she merges into her surroundings quite easily. Her ability is being able to fly, that is, being weightless. The gravity of Earth, any level of stress, and threats of power all mean nothing to her. Both her mind and body float in the sky of fantasy, a mysterious shrine maiden. However powerful the opponent is, that means nothing in her presence. As she evens out whatever status one has, she tends to attract anyone regardless of species, human or youkai. Her weapons are amulets and a Yin-Yang orb. She is also preferred by mosquitoes. She teams with Yukari this time. Focused speed only applies when she's used as a solo character. She lacks a bit in damage, but is quite easy to use and doesn't need much memorization. She's quite strong, especially against smaller enemies. The all-too-familiar shrine maiden of the Hakurei Shrine located on the border of Gensokyo. The Hakurei Shrine itself exists simultaneously in both Gensokyo and the Outside World. The Shrine Maiden of Hakurei Shrine. A human living at the boundary. She possesses the ability to fly in the air. She's the kind of shrine maiden that's ever-so-carefree and doesn't think about anything. Whenever a disturbance occurs, she'd immediately rush to resolve it. Nevertheless, she'd never manage to rid herself of all disturbances around her. Rather, it might be the case that she attracts disturbances to herself. She has always been able to bring incidents to closure with her intuitions, but she hasn't the slightest idea of the cause of this flower incident. In multiplayer games such as this installment of the Touhou Series, it's hard to pinpoint which character is the main character. However, even though Reimu doesn't stand out at all, why does she always look like one? The all-too-familiar shrine maiden of the Hakurei Shrine. She treats everyone basically the same way. However, since her job is hunting youkai, she takes a fairly strict stance against youkai, but she's actually equally uninterested in humans and youkai. This time, there's a conspiracy surrounding her gods. She may be their spokesperson, but her circumstances as a youkai hunter are different, so she feels a bit lost. Her weapons are amulets and yin-yang balls. Her piety seems light. Her fighting style generally relies on equipment that lends a sense of stability. Ability: Flying in the air. Personality: Carefree and sentimental. Not too attached to the world of the living. She treats everyone the same. However, since her job is youkai-hunting, she acts particularly strict with youkai, but she doesn't really care much about humans or youkai. She is easily well-liked by youkais, especially the strong ones. She prefers high places compared to the underground. Where there's a treasure ship, there has to be the seven gods of luck. She figures that where any gods are involved, it's a job for her, but most of the seven gods of luck aren't Japanese gods. Her true goal is the treasure. The familiar shrine maiden of the Hakurei Shrine. She appears pondering, like every other day, of how to get more visitors of her shrine. It's not that she's a clump of greed, but that she's only acting natural. She doesn't differentiate between humans and youkai. She goes off to investigate after being alerted by the odd divine spirits, that seemed far too shabby and numerous than they should. It'd be troublesome if she just left them alone and something happened, in which event her shrine would be blamed. It was there, within the mountain distance away from the human village, in the far off country in the East—Gensokyo. It has been a while since it was separated from the outside world by the Barrier, which the youkai made. Things that were forgotten from this world, things that were no longer needed, have been gathered around at the place. Due to such nature, Gensokyo should have become a paradise for the youkai. 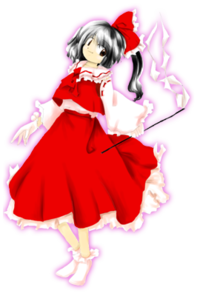 Reimu Hakurei is too, one of the people residing in Gensokyo, who makes her living by exterminating youkai. "Huh? What's this, an interview? Do I have to say something? I mean, who're you anyway?" are both in a state of excitement. Their blood is boiling for one reason. From here on, the shrine maiden and her rivals will be battling it out. Emerge victorious in this battle, and acquire unwavering popularity! so her maximum spirit power is increased. and even if she loses some spirit power while guarding attacks, she'll still have more in supply. and then surrounds the enemy with massive amounts of ofuda and annihilates them in her most powerful attack. so it's also easy to wear down and flatten opponents fearful of the counter. Her weapon's called a purification rod, but its formal name is the oonusa. she has more success carrying it up to the enemies and then throwing it. Somehow, it doesn't seem to be very satisfactory as a purification rod. The all-too familiar, wonderful Shrine Maiden of Gensokyo. A well balanced standard character who fights with both projectiles and physical attacks. Recommended to beginners who want to learn of the duels of this world. Her Occult Attack is “The Gap in the Great Hakurei Barrier”. It’s a projectile-type attack that opens a gap in mid-air, where from wreckage flies towards the opponent. Since Reimu herself moves independently from the gap, she can also attack simultaneously. The lunar emissaries have at last arrived for real. it's obvious that this will be the first truly difficult battle for her in a long while. This time, she's forced to fight a battle with no room for error. That's what we're calling 'Perfect Possession'." and there's been plenty of strange weather before, so she doesn't think that this is an issue. That conceit leads her to severely misjudge the true nature of the incident. This page was last edited on 17 April 2019, at 06:39.